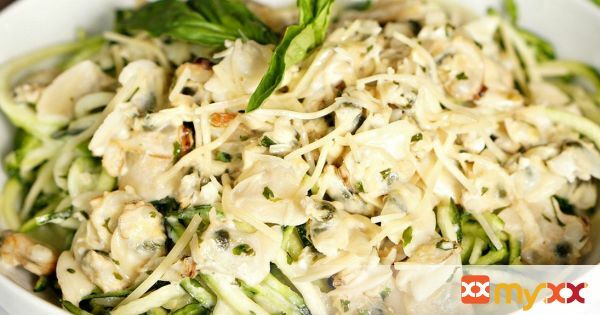 Zoodles with Parmesan Garlic Clam Sauce- a easy to make light dinner. 1. Melt butter in a sauce pan over medium high heat. Add garlic and stir constantly for 30 seconds making sure not to burn it. Add in clam meat and stir another 2-3 minutes. Pour in white wine and olive oil and bring to a boil. Simmer until the liquid is reduced then add the heavy cream, parmesan, parsley and salt and pepper to taste. Cook until heated through and thick. 2. Meanwhile, bring a large pot of salted water to a boil. Drop in zucchini noodles then immediately drain. 3. Add zucchini noodles to a serving bowl and pour clam sauce over top. Garnish with additional Parmesan cheese, if desired.